Dubai: 2000's. A bustling economy is poised for unchartered growth as the world watches a tiny city-state make its mark. The city quickly rises out of sands into global top ten lists: quality of life, business-friendliness, tax-freedom, autonomy, cultural tolerance, trade volume, GDP year-on-year growth, tourism destination, etc. The real-estate sector explodes with the advent of foreign ownership laws. The city emulates its own successful cities-within-a-city "freezone" model to diversify into a broad spectrum of verticals - media, technology, industry - with several more penned. The national airline gains prominence outflying global giants. Vegas is set to be dwarfed by Dubai's hospitality plans. Visible from space, several palm-shaped islands are designed to add miles of shoreline to the city. Brand "Dubai" becomes synonymous with entrepreneurial ambition. Dubai: 2010. Dubai elevates into a case study at Harvard Business School. It defies conventional wisdom as the world watches. It is now 2009. The proverbial bubble has burst. The global press exaggerates the plight of the city to paint epic end-of-the-world scenarios. The real-estate sector swells through the decade into an disproportionate economic focus. 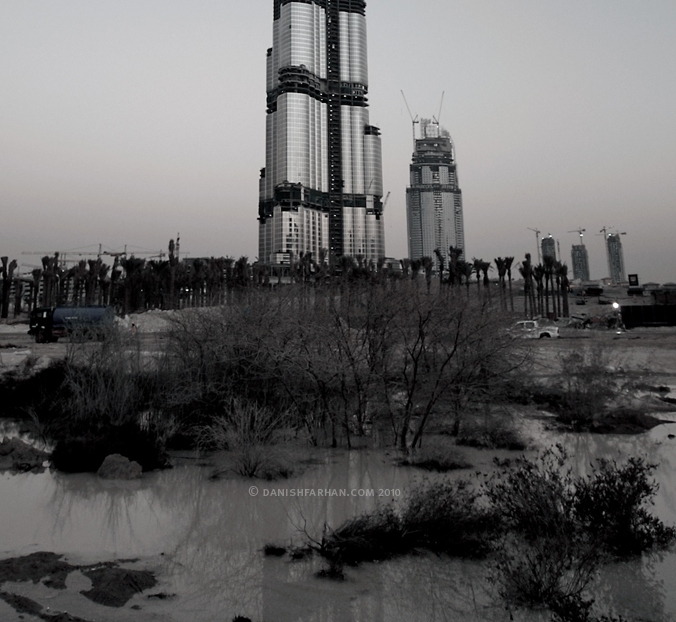 While the city continues to score well on most counts, the widely unregulated real-estate sector unhinges Dubai's otherwise organic growth into an unstable landslide. A domino-effect ensues, leading to a full-year of economic contraction. Credit-fuelled lifestyles and over-leveraged mortgages mature into catastrophic debt levels for a substantial majority of the expatriate population. Inevitably, businesses built on rocky foundations shut shop. Cost of living, despite tax-free income, inflates to inexplicable levels competing with London and Manhattan. People are forced to flee. Dubai: 2020. Another decade is quickly unraveling. In contrast to popular lore, the city has begun charting an unprecedented course--one of unified resurgence. It no longer remains simply about Dubai. Instead, a reinvigorated country emerges. Fox News has aired a sensational series of features that likens Dubai to the lost city of Atlantis. Meanwhile, a slow cultural renaissance is emerging, born out of the massively critical global outlook of Dubai. Globally, an inevitable power shift ensues, from the West to the Western lands of Asia. The city of Dubai, once again, finds itself on a strategic advantage. This time around, a key facet of the city's foundation is its soft infrastructure. Although trade continues to thrive, the city has successfully embraced a true knowledge economy. To American President Palin's initial dismay and political wrangling, Dubai now successfully plays host to global headquarters of the two most definitive companies of the decade: Google Inc. and Apple Inc. The country has embraced the 'Khaleeji' -- a common currency across the Gulf. A joint Central Bank is co-located between Riyadh and Dubai. Home-based businesses begin to flourish, fueled by innovative government schemes. A revolutionary alternative fuel cell is developed in a garage in Al Barsha. Nasdaq Dubai mushrooms into the largest stock exchange East of New York. Emirati artists routinely exhibit at the Tate Modern, while the Louvre Abu Dhabi predominantly features a fusion of artistic works from the country. Street art emerges as the defining element of the city's walking districts. The city has transformed into a bilingual example of cross-cultural harmony, where it is no longer expected of the nationals alone to speak in English, while their foreign counterparts make no effort to learn the language of the land. It is no longer uncommon to see Emiratis working alongside their expatriate counterparts. A strikingly unique community has spawned out of mutual understanding and respect, never quite seen before. The most potent everyday reality remains this: a vision that once united a people--from all walks of life, faith and aspiration--is being rebuilt, one day at a time.